On 11 March 1911 several members of the public reported seeing a heavily-armed airship flying eastwards over Sebastopol in Ballarat, Victoria to descend behind Mt Warrenheip. Similar instances were reported in Kyneton and Portland. These stories were a common feature of newspaper reports during World War I. Far from being simply dismissed, though the more outlandish stories were met with considerable ridicule in some sections of the press, these sightings were taken very seriously as potential threat to Australian security. The desperate fear of German aerial attack was extraordinary given that this was a time when German airships and bombers were struggling to reach London let alone remote colonies in the Pacific. Still, the panic persisted with gorgeous illustrations in Australian newspapers and panicked reports in local papers. 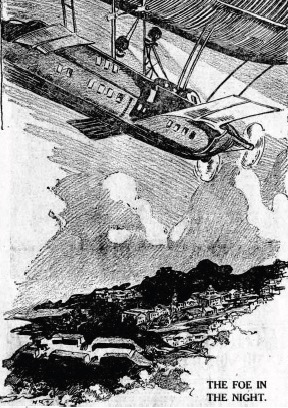 The newspapers of Australia were filled with reports of mysterious aircraft, abductions and German airships. They were also filled with horrific depictions of what future wars would be like in the advent of this new technology. There are tales of vast fleets of airships firing ‘aerial torpedoes’ which could be launched from out of visual range and controlled to their helpless targets by wireless controls; an image reminiscent of our modern use of military drones and guided missiles. These stories fueled a panic regarding German airpower which did not eventuate militarily until the blitz of World War II. Airmindedness pertains to the cultural fixations and representations air travel and air technology. In the positive sense, it relates to wonder at the freedom and exploration of air flight. In its negative connation, it represented fear of an aerial assault. Interestingly, Holman’s research indicated that the Australian government at the time was happy to support these anxieties given the support they engendered to the war effort. This remains a little known but fascinating part of Australia’s World War I heritage which led directly to the phenomenon which we would now call today UFOs and flying saucers. Indeed, the behaviour and depiction of the craft are remarkably similar to those described by eyewitnesses during the Cold War era of the 1950s and 60s. In the end, these panics were identified at the time as signs of the coming German threat. They are perhaps better described as close encounters of the Prussian kind! Brett Holman, ‘Dreaming War: Airmindedness and the Australian Mystery Aeroplane Scare of 1918’, History Australia 10 (2013): 180-201. Written by Dr David Waldron, history lecturer at Federation University. Leave a reply on "Australia’s Mystery Airship Panics of 1900-1918"